Pairs of spectacled elder arrive at their breeding grounds with their mates already selected. The male spectacled eider is unique. The painted head of this large sea duck ranges in color from pale green to bright orange, making it one handsome bird. Gaze closely and the distinctive “goggles” or “spectacles” around the eyes that give this eider its name come into focus. Yet all the finery fades away when the mating season ends, and male eiders once again resemble females in their appearance. Thanks to the Center, the spectacled eider's critical habitat will not fade away, like its plumage, come winter. In 1998, we initiated a legal process to pressure the U.S. Fish and Wildlife Service to designate critical habitat for this imperiled sea duck. Blind to the threats of oil development in the region, the agency had failed to take action on protecting this habitat for several years. In keeping with a settlement agreement with the Center and Christians Caring for Creation, the Service initially proposed 47 million acres as critical habitat for the spectacled eider. When the agency made its final designation the following year, the area defined as critical habitat had shrunk to 25 million acres, with habitat in the Beaufort Sea and National Petroleum Reserve eliminated. The Center continues to work to protect these areas. 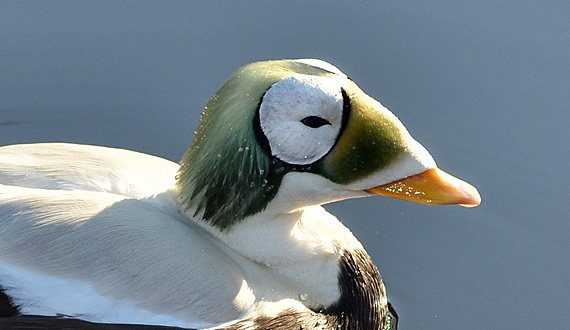 The spectacled eider faces many threats, primarily oil and gas drilling. In 2007, we successfully interrupted plans by Shell Oil to begin exploration near the Arctic National Wildlife Refuge. A court determined that the project's environmental impacts needed to be reviewed more thoroughly, as well as the potential consequences to a number of threatened species, including the spectacled eider. Mystery: Why is the Aleutian ecosystem collapsing?